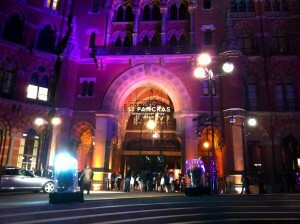 The new St Pancras Renaissance Hotel London has taken 76 years to return to its original use. Developed by Manhattan Loft Corporation at a cost of £150 million, it offers everything you would expect from a five-star, modern establishment. Yet its past has not been forgotten as so much of the original has been retained. St Pancras – both the hotel and railway terminus – is stunning. The railway shed was designed by the Midland Railway Company’s consulting engineer, William Henry Barlow and, when completed in 1868, was the largest single-span structure in the world. 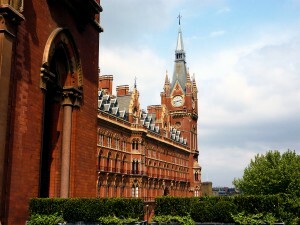 The station hotel was the creation of architect Sir George Gilbert Scott who had to design a building around the station. This is the edifice that people always think of when they imagine St Pancras, the public face of the station facing the Euston Road. 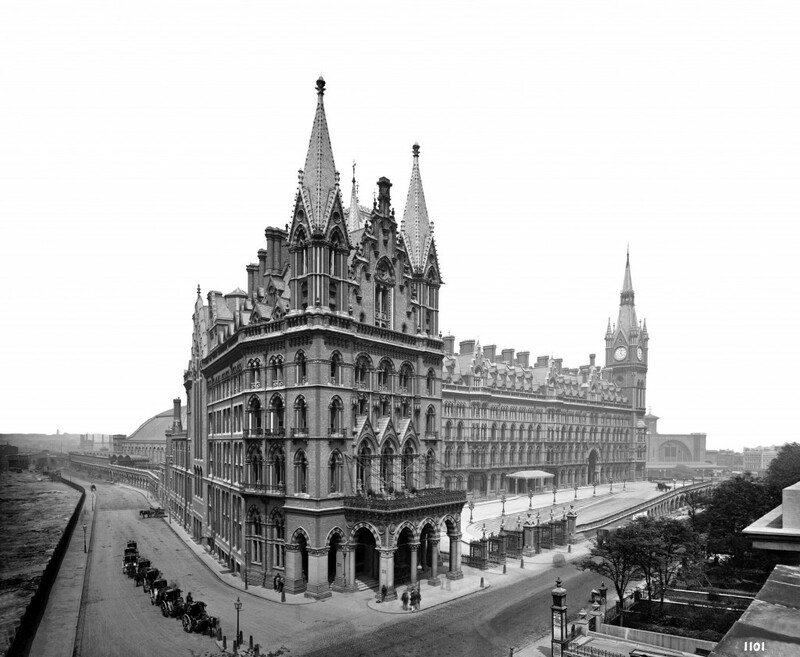 The Midland Grand Hotel 1881 photographed by Bernard Lemere showing Barlow's train shed to the left and King's Cross station to the right. Copyright National Mounuments Record/English Heritage. But how did the station come to be built in the first place and why has it taken so long for the Midland Grand to return to life as a magnificent hotel building, after wasting away for years as British Rail offices? Until the 1860s, the Midland Railway Company (MR) had no direct line of its own into London and was reliant on a rival – the London and North Western – to let it use its track from Rugby – at a cost to the MR – to get its trains into Euston. From February, 1858, the MR was also able to use a new line from Leicester to Hitchin to haul passenger trains into King’s Cross, while also having to pay tolls for the privilege to its rival, the Great Northern. The MR itself came about because owners of coal mines in the midlands and the north needed to find new markets in the south but the LNW and GN would often hold back Midland trains from their connecting junctions to let their own goods and passenger trains through first. These delays were obviously a great source of aggravation to both the mine owners and the railway. 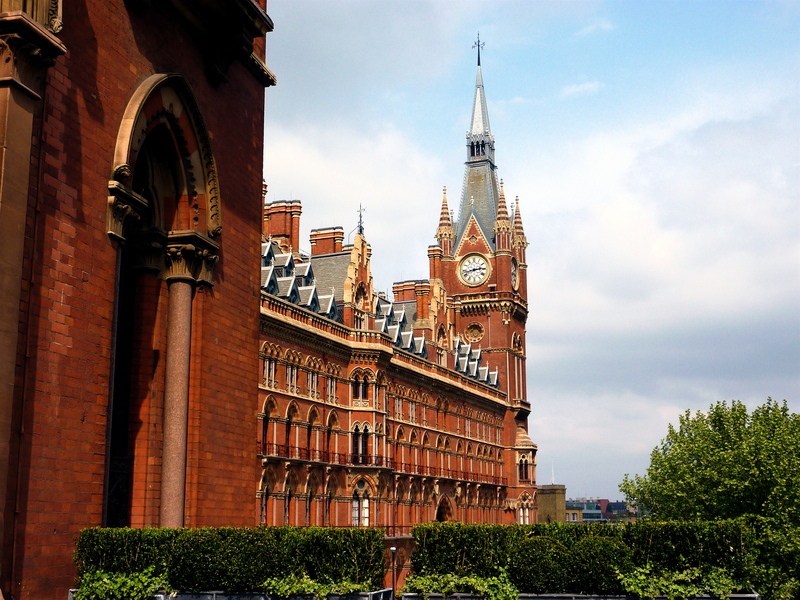 The MR was determined to end this state of affairs and had been buying up land near St Pancras since 1861 with a view to building its own terminus in the capital. The land was owned by Lords Somers and Agar and occupied by 3,000 properties housing around 7,000 people. Their lordships rented the land to unscrupulous landlords who pocketed nearly £20,000 (almost £2m in today’s money) for use of the site and the residents were made homeless. They never received the compensation which the MR had given to the landlords to pass on to them and had to find refuge in even worse slums nearby. The area was, in fact, one of the most rundown in London. Dickens had described it as ‘stinking and full of cholera’. Thousands of coffins and bodies were disinterred for reburial from the old St Pancras Parish Church during construction of the station and more than 1200 navvies, 111 horses and 22 steam engines toiled away for three years until it finally opened in 1868. The first passenger train to leave St Pancras was the 10AM Manchester express on 1st October, 1868, which travelled from the station to Kentish Town to pick up passengers and then did not stop until it got to Leicester, a distance of just over 97 miles, then the longest non-stop railway journey in the world. Scott hoped to set a standard for architectural design in this way, although it proved to be unique. Its form derives partly from the town halls and cloth guilds of Antwerp and Brussels but also from 13th century English and French ecclesiastical architecture with its ‘simple tracery, projecting oriel windows of stone and sprig-like capitals to the columns’, as Bradley points out. The materials used represented the area where the railway owners themselves originated. London buildings of the Victorian era were not normally red in hue, but visit the midlands and red brick abounds. 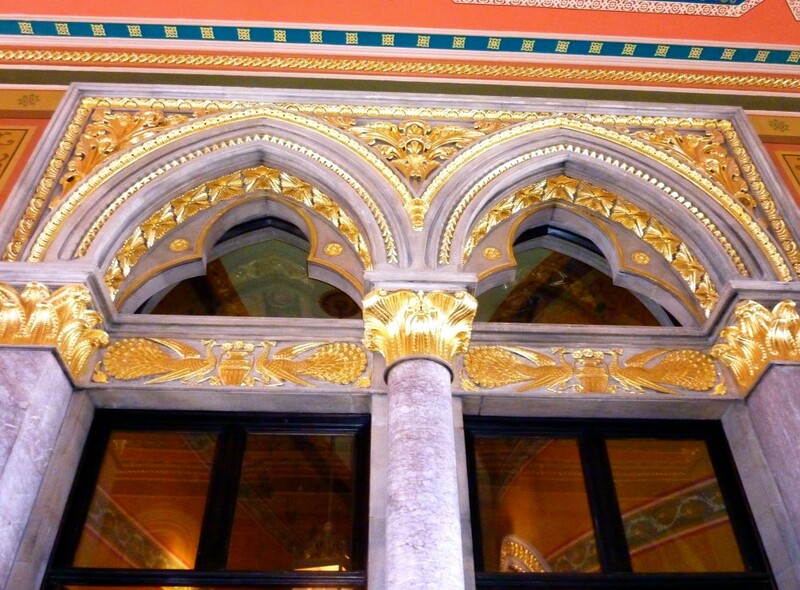 Royden Stock, the Renaissance Hotel’s historian and tour guide, points to the immense, curving façade where “everything, apart from the granite, comes from that part of the country. The bricks are from Nottingham, the stone is Ketton, Ancaster and Mansfield, the roof slates were originally from Leicestershire and the ironwork is from Coventry. What the MR got for its money were 250 magnificent bedrooms, fifty sitting rooms and another fifty dressing rooms along with 250 other rooms which made up the station site such as the servant and public rooms. Baedeker described it as the best railway hotel in London and the Midland Grand charged like no other hotel at 14 shillings a night for its best rooms, sixpence more than the stately Langham in Portland Place, then regarded as the epitome of hotel living. 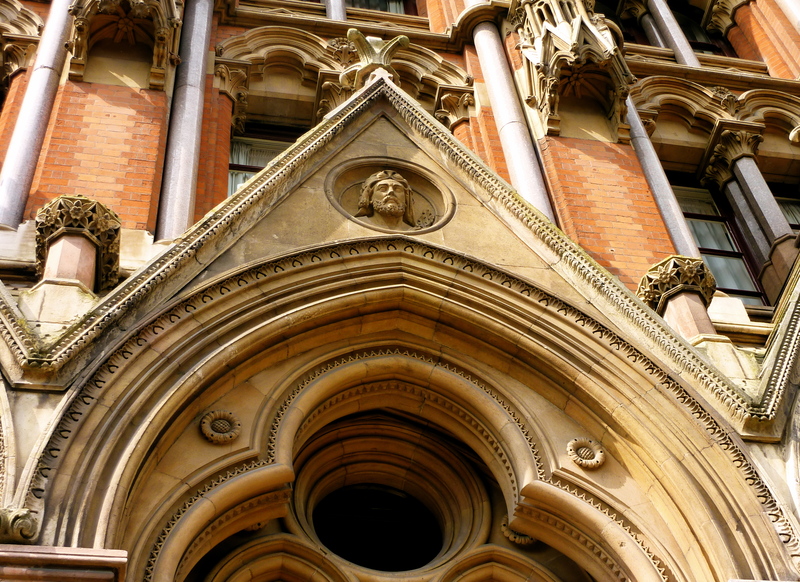 Staff numbers today at the St Pancras Renaissance Hotel number 250 full-time and around 150 part-time which is a high guest-staff ratio. One of the reasons often cited for the Midland Grand’s demise was that staff numbers were always too high to make a profit but, as Royden points out, this is a misconception. “Because the railway company had other hotels, when they weren’t needed here they would send them back north to work in them. They would travel on free rail passes so it cost nothing to move them around and all the hotels were on the rail route at different stations so they could virtually walk straight into their work place from the platform. I looked through the census returns which show staff numbers but also the wages lists and that’s what tells the true story. In total at Midland Grand there were probably between 120-150 staff at any one time.” However, it is true that the hotel was rarely full with guests never numbering more than 400-500 at any one time. The hotel boasted two hydraulically-operated passenger lifts known as ‘ascending chambers’, flush toilets and electric call bells. It also featured the first privately-owned public room in Britain to have a revolving door, and only the second of its type in London when it was installed in 1899. 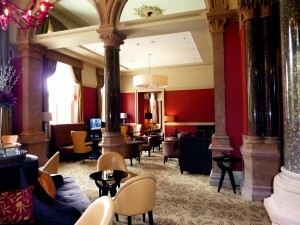 Now its successor can be seen at the entrance to The Gilbert Scott, the hotel’s restaurant run by Marcus Wareing. Diners entering through these doors are met by some of the most spectacular décor in the hotel, not surprising given the time and money that was lavished on this south-western corner. The dividing screen leading to the restaurant won the National Stone Award last year and it is here that Scott nods more towards the ecclesiastical than anywhere else as Christian symbolism is evoked in the peacocks on the window cross-members which signify the rebirth of Christ, the doves which landed on the shoulder of Christ and the eagles which represent the eye of God. And all this before sampling the delights of Chef Wareing’s kitchen. It may prove impossible for many diners to venture beyond the restaurant, but for those that do, a wonder awaits. 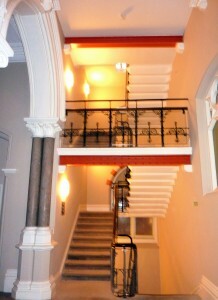 The corridor beyond curves gently round until the guest is met by the spectacular view of the Grand Staircase. 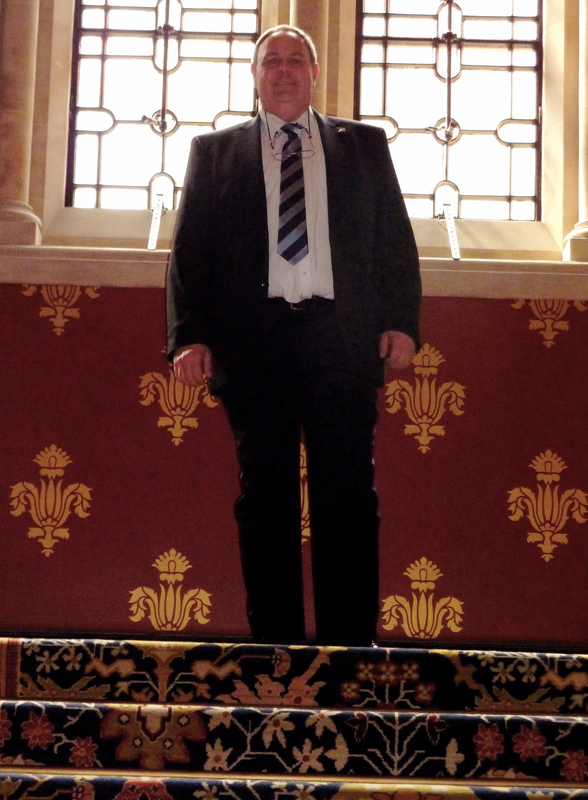 No single image can do justice to the staircase, as Simon Bradley says, but all 2,300 gold fleurs-de-lys have been restored to their original state, circa 1901, while the vault is blue with painted sun and stars. Royden takes up the story: “We’ve restored the Minton and Hollins tiles but you can see just by looking at them that they’re virtually all original. 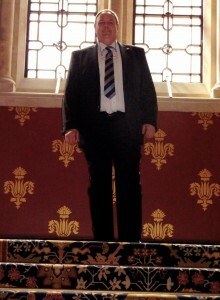 The carpet is a copy of the original Axminster Wilton woven for us by Brinton’s of Worcestershire. It’s been made deliberately faded as too bright colours would not have looked right in these surroundings and the wrought iron balustrades by Skidmores of Coventry have been refurbished. Facing the staircase on the first-floor landing is the only mural, of the original 30 painted, still on show to the public. The Garden of Deduit was created in the early 1890s by the Scottish artist Thomas Wallis Hay and depicts lovers dallying in the garden of Sir Mirth, a scene inspired by the 13th century verse romance Le Roman de la Rose. 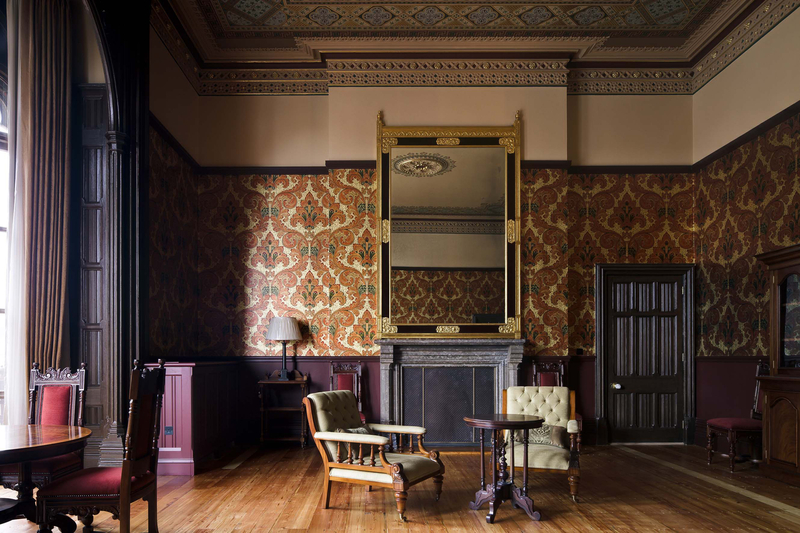 Climbing the stairway eventually leads to yet another restored masterpiece – the Ladies’ Smoking Room, originally the Ladies’ Reading Room. 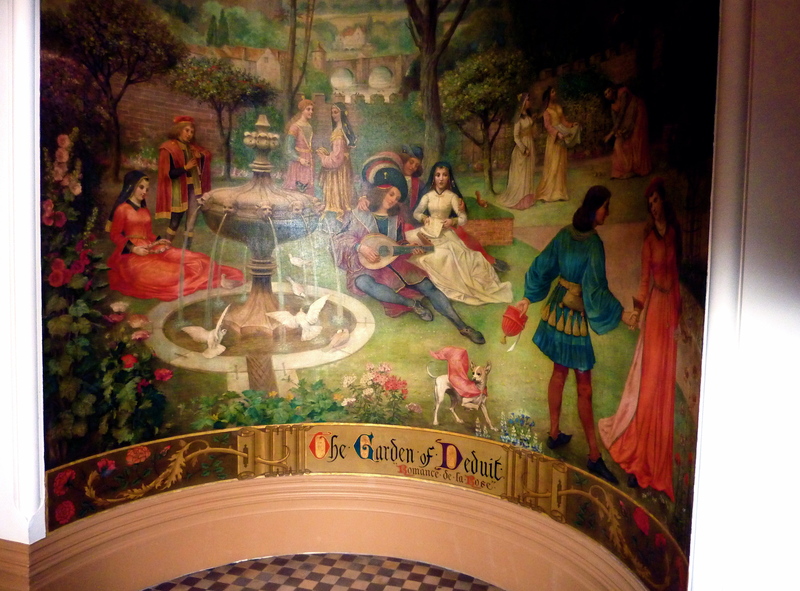 “It was redesignated in 1898 as a smoking room for men and women,” explains Royden. “That actually meant that it was the first room in Europe where ladies could smoke in public so the new name emphasised the fact that ladies could smoke here. Women basically took the place over and it was viewed as a highly fashionable place to see and be seen. Men probably didn’t get much of a look-in! The columns look like marble but are in fact granite, the only exterior building material which did not come from the midlands. There are two types: shap from Cumbria and Peterhead from Scotland, the latter shaded pink and grey. A corridor runs the length of the building at first-floor level, 420 feet in length. About half way down is a room which very few people may get to see unless they hire it or go on an extended tour. 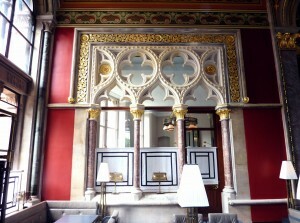 It could only have been called the Sir George Gilbert Scott Suite after the great man himself. This was originally the principal sitting room in the hotel, decorated more richly than any other. A large, wealthy family, for example, would hire a series of rooms for themselves and their children with additional rooms for the female servants (the male servants would be sent to the top floor quarters). This particular sitting room could be joined to a maximum of fourteen other rooms including bedrooms and dressing rooms. The room is breathtaking today, which is no surprise as it has had to be restored to its original specifications by arrangement with English Heritage. “This room has its original ceiling decoration, its original design wallpaper, its original mirror, floor and fireplace,” says Royden. “The ceiling we uncovered to make it easier to repaint but the wallpaper was only revealed when we removed the mirror for restoration. We were having difficulty getting back to the wallpaper under many layers of paint, we just couldn’t get a sample big enough. 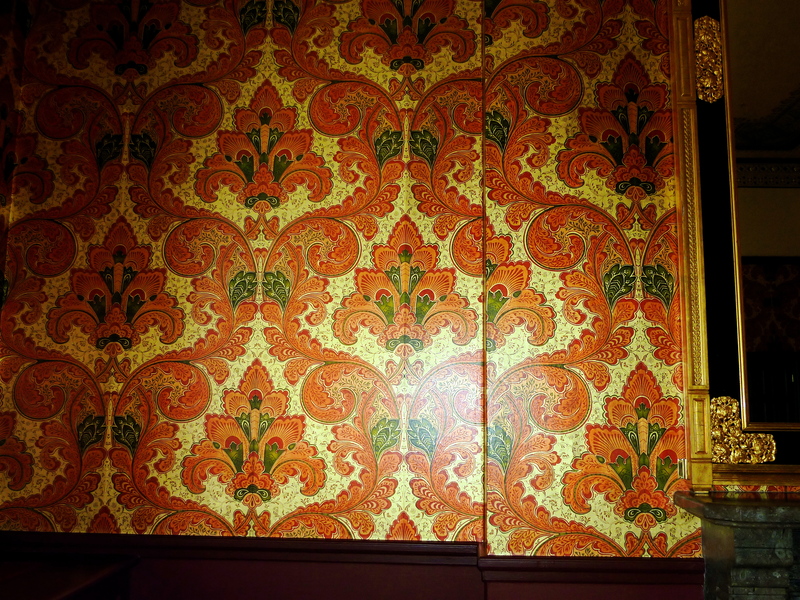 But when we removed the mirror it revealed three perfect strips of wallpaper underneath it. 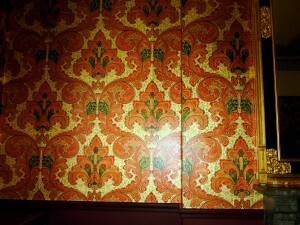 “To have this wallpaper remade cost £47,000. The paper itself was especially made and it took five people eight months to complete with real gold leaf in many sections. It cost another £12,000 to fit it. Wallpaper tends to shrink and this did as well. It couldn’t just be overlapped so it was painted between the gaps to make it match seamlessly. In fact, this worked so well in deadening the noise that the company decided to make a £1,000 donation to Pancras Parish Council so they could carry out the same work from Midland Road down to Pancras Road to further reduce the noise for the guests. The Sir George Gilbert Scott Suite, which can be taken with up to five bedrooms, is likely to be used initially as a meeting or private dining room. Even the staff staircase leading from the main corridor has intricate iron scroll decoration which only becomes slightly plainer at the fourth and fifth floor levels. This attention to detail was typical of Scott. However, despite the care and money lavished on its construction, the hotel eventually became uneconomic to run. It was simply too old fashioned, the staff were merely serving time and not the guests and it would have cost too much to modernise. In 1933, the MR chairman, Sir Josiah Stamp, told a gathering of architects that although the building was undoubtedly a masterpiece of its time, it was now ‘completely obsolete and hopeless’. 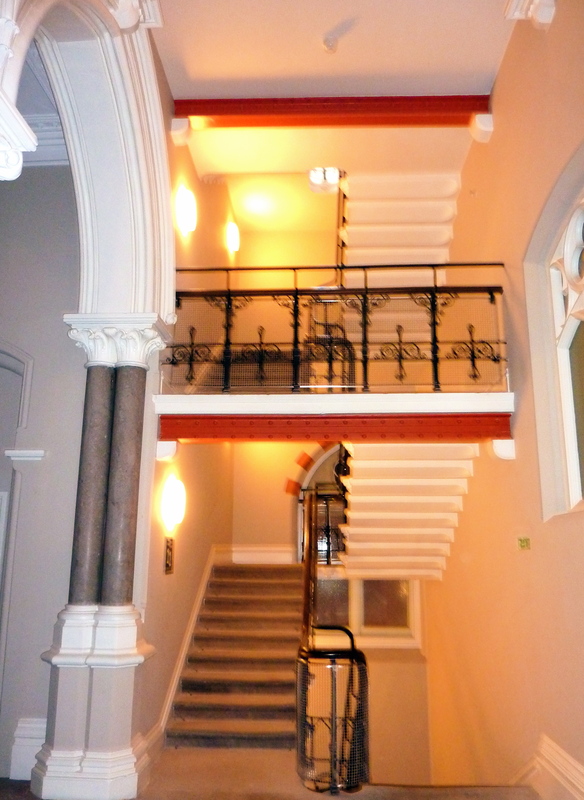 The subsequent years of use as railway offices were not kind to the old building; the one saving grace was that much of the original fixture and fittings were simply panelled over and so were preserved to a degree when refurbishment finally got under way. One section, which is now open only to guests, is the Chambers Club, for those who book suites or the more expensive rooms in the Chambers, the original building facing the Euston Road. 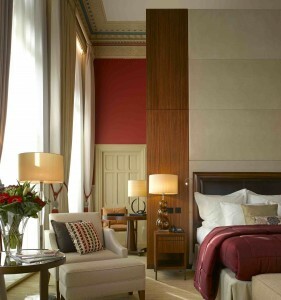 The hotel also houses a newly-created extension to the west called Barlow House which houses additional rooms. 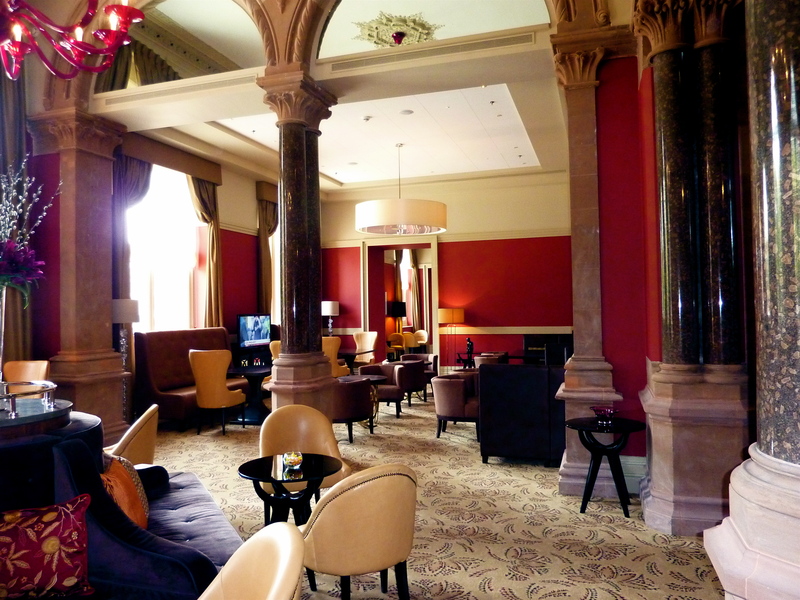 Residents can take breakfast, afternoon tea and evening snacks in the Chambers Club, an area which was originally the main public entrance to the Midland Grand. Known as the Terrace Entrance, it was then a coffee room from where guests could risk the hydraulic lift or take a gentle climb to the first floor where porters would take their luggage and check them in. Today, the businessman can work on his laptop overseen by a collection of modern art. 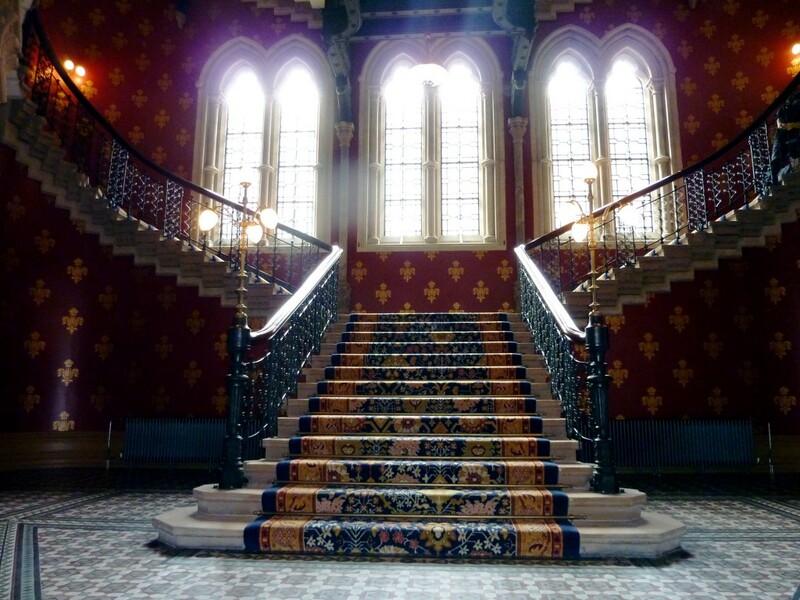 Quite simply, there is no other building like the St Pancras Renaissance in London. A combination of cathedral and Low Countries municipal might, bound together by sturdy midland brick and ironwork, it makes the perfect point of departure to the continent by Eurostar – just walk straight out to the platform through the Booking Office bar and restaurant. Add the spa and Melogy barbershop for men, and all creature comforts are provided for under one roof. Sir Josiah went on to say in his 1933 speech that, if demolished and rebuilt as a hotel, the Grand would be just as unfashionable in another sixty years. Ironically, it has taken a little over that period of time for a state-of-the art hotel to reopen on the site and bring an added sense of purpose to the station and the area itself. Although St Pancras station buildings were granted Grade I listed status in 1967, it was not without a fight. Sir John Betjeman, prominent in the campaign to save the station from the wrecker’s ball, occasionally became despondent in the face of the onrushing tide of concrete brutalism. He famously said that the neo-Gothic creation was “too beautiful and too romantic to survive” in the modern era. It has taken millions of pounds and years of effort, but happily, he has been proved wrong.